If you are new to online share trading and want to know how to go about finding the best online stock broker, then it helps to know what different brokers offer and what you should be looking for. You want complete confidence that your hard-earned money is being looked after by someone with experience and knowledge, through a brokerage firm that won’t take your money in fees, commissions and various other costs. For those new to online trading, learn what you need to consider when looking for the right online stock broker to suit your needs. Many stock brokers require you to have a minimum account size before they will start trading for you. Minimum account sizes range from $500 up to $10,000. However, there are some online brokers who don’t require you to have any minimum account. If you plan to start out trading with a few thousand dollars, then this shouldn’t be too much of an issue. If however, you do want to start small while you gain experience, don’t feel pressured to commit more money than you feel comfortable with. Instead, find a broker who is willing to start you off trading with a smaller sum of money. It also pays to note that some shares require you to buy a minimum amount. This may be as little as $1,000 or as high as $10,000 worth of shares. Some online brokers require you to pay account fees. These are usually classed as annual administration fees. For those who only want to keep small trading accounts, look for a broker that either offers no account fee charges or offers minimal account fees. Once your account reaches above $10,000 or $25,000 you should expect the annual account fees to either be introduced or increased. If you choose a broker that offers very small minimum account sizes, be sure to find out if you will be penalised by any additional account fees because of this. This is one trick of the trade that many new investors are not aware of until they are charged with this additional cost. A commission fee is charged every time you buy a stock and every time you sell a stock. All online brokers charge commission fees. How much commission each one charges is the important deciding factor when looking for an online stock broker. You can be charged a different fee for buying or selling particular types of stocks. Be wary of the range of commission fees a broker charges, comparing their fees to the types and amounts of stock you are looking to trade. Commission fees can be as low as $1 or as much as $30 per trade. Online brokers offer a range of features connected to your online trading account. Up-to-date streaming charts and data are usually part and parcel of any online broker relationship. They allow you to see your account and the market in real time. However, some brokers like to offer added features to their clients. Various analysis tools, additional data and up-to-date news features are available with selected online brokers. Just note that some of these additional features may come with a monthly fee attached to them. Some people prefer to only communicate with their online broker via email or phone. If this is the case, then your online broker’s location shouldn’t matter too much. They may be located in the same city or on the other side of the country. Just being online may be enough for you. However, if you want the opportunity to meet with your broker in person at any time, then it pays to find a broker who is local to you. Before choosing your online broker, be sure to find out if they actually want to meet. Often, brokers want to sit down face-to-face with their clients initially and at intervals throughout the year. If you find an online broker who wants regular meetings with you, then make sure his or her offices are easily accessible. About the Author : Andrew Peat has been an online broker for almost 5 years. 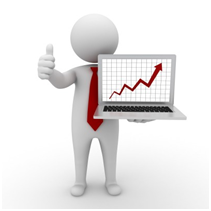 During this time he has focused on building a database of clients who are new to stock market investment. He regularly writes for various investment and financial sites.